Former Secretary-General of the UN Kofi Annan. Photo: UN/Jean-Marc Ferré. Former UN Secretary-General and Nobel Peace Prize laureate Kofi Annan died on Saturday at the age of 80, his foundation said, after decades of championing efforts to try to end protracted conflicts in Africa, Asia, and the Middle East. Annan, a Ghanaian national, died in a hospital in Bern, Switzerland, in the early hours, his close associates said. In Geneva, the Kofi Annan Foundation announced his peaceful death after a short undisclosed illness with “immense sadness,” saying he was surrounded in his last days by his second wife Nane and children Ama, Kojo, and Nina. 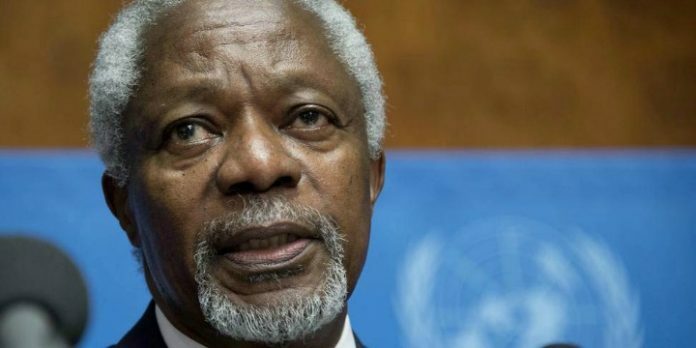 After rising through the ranks of the United Nations, Annan served two terms as UN Secretary-General in New York from 1997-2006 and retired to live in a Swiss village in the Geneva countryside. His 10-year-old foundation promotes good governance and the transformation of African agriculture. As UN boss he was linked to peace efforts to reunite the divided island of Cyprus, submitting a reunification blueprint which was rejected in a referendum by Greek Cypriots in 2004. “The UN can be improved, it is not perfect but if it didn’t exist you would have to create it,” he told the BBC‘s Hard Talk during an interview for his 80th birthday in April, recorded at the Geneva Graduate Institute where he had studied. Former US presidents praised Annan. “Kofi Annan devoted his life to making the world a more peaceful place through his compassion and dedication to service. He worked tirelessly to unite us and never stopped fighting for the dignity of every‎ person,” US envoy to the UN Nikki Haley said. Zeid, who has criticized major powers and other countries during his four-year term that ends later this month, said that whenever he felt “isolated and alone politically,” he would go for long walks with Annan in Geneva.